HP offers Envy 5032 all-in-one with speedy printing, copying and scanning functions from a single machine. The printer has some of the most sought-after features like mobile printing and automatic double-sided printing. The all-in-one weighs 5.5 kg and measures 128 x 445 x 367 mm (H x W x D). It features a 2.2-inch black and white display that allows you to communicate with printer easily. You can print high-quality photos with a resolution of 4800 x 1200 dpi and speed of 9.8 ppm (ISO). The print speed and output quality of the draft mode are also impressive. HP has made printing much more cost-effective with double-sided printing and HP Envy 5032 All-in-one Ink Cartridges that come with Instant Ink on a 5-month free trial. The Instant Ink technology automatically enables the printer to order black and colour inks so that you don’t run out of inks when needed the most. Besides, it offers flexible connectivity options with WiFi, high-speed USB 2.0 and Bluetooth. The wireless capability allows you to print via any smart device. The machine is compatible with some versions of Windows and Mac PCs. HP Envy 5032 all-in-one reflects efficient and affordable performance for printing, scanning and copying. 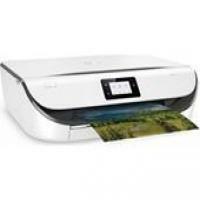 It allows printing remotely via smartphones or tablets in the house using HP smart apps. Printing has been made much more cost-effective with HP Envy 5032 All-in-one Ink Cartridges supported by Instant Ink and automatic duplexing. Hence, home users who are looking out for an all-in-one to use it on regular basis can definitely opt for this printer. What to do if the quality of printout is not appropriate? How to achieve consistent print results by replacing the cartridges? If the quality of the print is not appropriate and your HP Envy 5032 All-in-One Ink Cartridge is not delivering the ink properly. Follow the steps below to achieve consistent print results. The steps mentioned below are for replacing the cartridges. Keep all cartridges in their original sealed packaging until they are ready to install in the printer. Make sure to turn off the printer properly. For more information, refer to your online user manual. Store the HP Envy 5032 All-in-One ink cartridges at room temperature. Storing them at room temperature will prolong the life of the cartridges. Proper environmental conditions are required for storage of the cartridges to increase their shelf-life. The minimum temperature required is (15-35° C or 59-95° F). Do not clean the printhead unnecessarily. Regular cleaning of the printhead is not essential. This may waste ink and shortens the life of the cartridges. One must handle the cartridges carefully. Dropping, jarring, or rough handling of them during installation can cause temporary printing problems and might affect the quality of prints. If you are transporting the printer from one place to another, do the following necessary steps to prevent the ink leakage. Also, follow proper measures to protect the printer from other damages. Make sure you turn the power off. Wait until the sound of internal motion stops before unplugging the printer. Ensure that you leave the HP Envy 5032 All-in-One ink cartridges installed and that your printer is not out of the cartridges. The printer must be transported sitting flat. Keep in mind to not place the printer on its side, back, front, or top. Following the measures mentioned above must resolve the problems associated while handling the ink cartridges and printheads. Also, to attain good print-quality perform regular maintenance operations. Q. What are the dimensions of the HP Envy 5032 printer and how much does it weigh? A. The dimensions of this printer are 128 mm (Height) x 445 mm (Width) x 367 mm (Depth). It’s weight is about 5.5 kg. Q. What are the connectivity options available with this printer? A. HP Envy 5032 supports USB 2.0 and Bluetooth for its connectivity. Q. Can you provide me with some tips for the handling of HP Envy 5032 All-in-One Ink Cartridges? You should keep all ink cartridges in their original sealed packages until they are needed. Be sure to turn off the printer properly when you are not using the printer. The ink cartridges should be stored at room temperature (15-35° C or 59-95° F). Do not clean the printhead unnecessarily. This results in wastage ink and reduces the life of the ink cartridges. Handle cartridges carefully. Rough handling during the cartridge installation can cause temporary printing problems. Q. Can I print documents from the HP Envy 5032 All-in-One using my mobile device? A. You can print documents and photos directly from the HP applications on your mobile devices. The applications are available on iOS, Android, Windows Mobile, Chromebook and Amazon Kindle. Q. I just ordered a pack of HP Envy 5032 All-in-One Ink Cartridges from this website. Is there any way I can track the order that I placed? A. When you have placed an order with us, you get a unique order ID with which you can track your order with our courier company. Q. My order of HP Envy 5032 All-in-One Ink Cartridges arrived today but I don’t see the name of the printer HP Envy 5032 on the box. Have the wrong cartridges been delivered to me? A. This set of ink cartridges (HP 304 XL) is compatible with a wide range of HP printers. If the name of your printer is not mentioned on the box, it does not mean that these cartridges are not compatible with your printer. However, if you still have any doubts and want to check before unpacking the product, please call us on 048 30833221 or email us at info@printerinkcartridges.ie.